It’s just around the corner, that day when you share your love with that someone special. 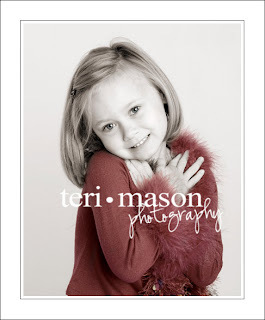 Celebrate this year with a Pure Love portrait session with Teri Mason Photography. Featuring a pure white background, your portrait can be bright and colorful, subdued and simple, or even black and white with a splash of color. This 20-minute session is designed for children of all ages and includes 20 custom valentine cards (w/envelopes) to hand out to friends. And the best part? It’s only $25 per child!! To “sweeten” the offer, we have some amazing collections, starting at only $149, and when you choose a collection, you get a custom portrait handbag as our gift! Yes, we are giving away a $100 handbag with any collection purchase! Why? Because we have just found these adorable bags and we want them in your hands! !